Gawain was not only Arthur’s champion, he was the champion of the ladies as well. He loved many women, but none too much — until one of his lovers told him she intended to marry another man. Now, a year later, he is running away from his disappointment, traveling north to fight against a mysterious warrior who has taken the hill-fort of the lady Ragnell. Note: Gawain and Ragnell is an expanded version of an episode in Shadow of Stone, so readers who have read the second novel of the Pendargon Chronicles will already be familiar with the story. The ebook includes an excerpt from the first book in the series, Yseult. Available FREE on Amazon, iBookstore, Kobo and B&N. Yseult the Wise and Yseult the Fair, mother and daughter, are members of the proud race of the Feadh Ree, the Old Race in Eriu. New ways and a new religion are coming to their land, and despite all their magic, they may be powerless to stop it. “Yseult: Two Women” is the first of four parts from the bestselling historical fantasy novel “Yseult: A Tale of love in the Age of King Arthur,” a retelling of the tragic love story of Tristan and Yseult. Yseult is a princess of Ireland, a land on the fringes of Europe, a land that had never been conquered by Rome. What would her life have been like in that pagan land before the advent of Christianity? This book is a re-imagining of Yseult’s youth, never part of the legends — until now. Drystan had imagined his homecoming very differently — not returning to a father who is breaking treaties and sleeping with his niece. In order to save his family’s honor, Drystan must fight a battle to the death and is seriously wounded. His only hope lies in the mysterious land of Eriu, and the healing powers of Yseult the Wise, sister of the man he killed. Drystan does not expect to survive the journey. Nor does he expect to fall in love with the queen’s daughter, Yseult the Fair — who has sworn to take revenge on the man responsible for her uncle’s death. Available FREE on iBookstore, Kobo and B&N. 99c on Amazon. Victoria Askew doesn’t want to leave remote Rolynka, Alaska when she finishes high school; it’s all she’s ever known. At least, not until her mother knits her the most beautiful sweater she’s ever seen, a sweater imbued with magic — a leaving sweater. “The Leaving Sweater” is a magic realist short story of about 2500 words or 10 pages. It was originally published in Strange Horizons in 2007. The story is part of the series “Tales From Far Beyond North,” an homage on the late great TV series, Northern Exposure. Available FREE on Amazon, B&N, Kobo and iTunes. “Mars: A Traveler’s Guide” was originally published in The Magazine of Fantasy and Science Fiction in January 2008. It was nominated for the Nebula Award in 2009. Available FREE on B&N, Kobo and iTunes. 99c on Amazon. For this one, my contribution was very small, as you can gather from the title — less than one percent. 🙂 This is a mutual project from a whole bunch of indie authors who hang out on Kboards, including Hugh Howey, Toni Dwiggens, Lisa Grace and many, many more. This anthology aims to be a showcase of recent indie writing. Hugh Howey launched the idea on Kboards, a forum for Kindle readers, but also the meeting place of an active community of indie writers. 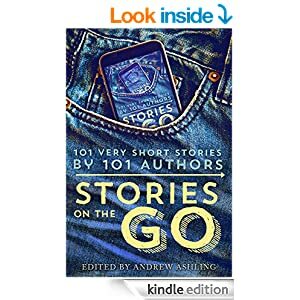 The result is this anthology of 101 very short stories by 101 authors. To make it more attractive for you, the reader, we set ourselves a limit of a thousand words. You should be able to read each story in under five minutes — on your desktop computer, laptop, or tablet at home or in the office, but also on your smartphone, on the go, while you are commuting or waiting at a coffee shop for your significant other to arrive. We included as many genres as we could. We hope that maybe, with only five minutes of your time on the line that would otherwise be wasted anyway, you’ll be tempted to venture outside your comfort zone and try out some new genres and new authors. Available FREE on Amazon and elsewhere. “Happily Ever Awhile”: Everyone knows the story of the filthy girl who married the prince by not bleeding into a glass slipper. But what happened to Ellie after the happy ending? “King Orfeigh”: A young Irish king has lost his wife to the king of Faerie. Is there any way he can win her back? Never Ever After is a collection of three previously published short stories, approximately 9000 words.